The First Austrian Republic (German: Republik Österreich) was created after the signing of the Treaty of Saint-Germain-en-Laye on 10 September 1919—the settlement after the end of World War I which ended the Habsburg rump state of Republic of German-Austria—and ended with the establishment of the Austrofascist Federal State of Austria based upon a dictatorship of Engelbert Dollfuss and the Fatherland's Front in 1934. The Republic's constitution was enacted in 1 October 1920 and amended on 7 December 1929. The republican period was increasingly marked by violent strife between those with left-wing and right-wing views, leading to the July Revolt of 1927 and the Austrian Civil War of 1934. In September 1919, the Habsburg rump state of German-Austria was given reduced borders by the Treaty of Saint Germain, which ceded German-populated regions in Sudetenland to Czechoslovakia, German-populated South Tyrol to Italy and a portion of Alpine provinces to the Kingdom of Serbs, Croats and Slovenes (Kraljevina Srba, Hrvata i Slovenaca, or SHS). Despite Austrian protests this treaty also forbade Anschluss, or union of Austria with Germany, without League of Nations consent. The new Republic was created by the will of Allies who did not want the defeated Germany to expand its borders. The new state managed to prevent two land claims from being taken by their neighbours. The first was the south-eastern part of Carinthia, which was inhabited partly by Slovenians. 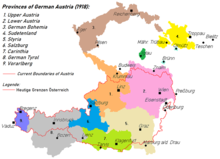 It was prevented from being taken over by the new SHS-state through a Carinthian plebiscite on October 10, 1920, in which the majority of population chose to remain with Austria. 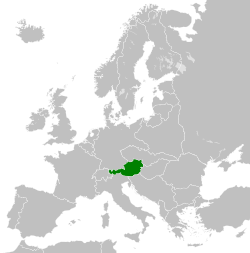 The second prevented land-claim was Hungary's claim to Burgenland, which, under the name "Western Hungary", had been part of the Hungarian kingdom since 907. It was inhabited mostly by a German-speaking population, but had also Croat- and Hungarian-speaking minorities. Through the Treaty of St. Germain it became part of the Austrian Republic in 1921. However, after a plebiscite which was disputed by Austria, the provincial capital city of Sopron (German Ödenburg) remained in Hungary. The treaty of Saint Germain angered the German population in Austria who claimed that it violated the Fourteen Points laid out by United States President Woodrow Wilson during peace talks, specifically the right to "self-determination" of all nations. Many of them felt that with the loss of 60% of the territory of the prewar empire, Austria was no longer economically and politically viable as a separate state without union with Germany. In a now small country of 6.5 million people, Vienna, with its population of almost 2 million, was left as an imperial capital without an empire to feed it, as only 17.8% of Austrian land was arable. For much of the early 1920s, Austria's survival was very much in doubt. This was partly because Austria had never been a German/Austrian nation state in the true sense of the term. Although the Austrian state had existed in one form or another for 700 years, it had no real unifying force other than the Habsburg dynasty and the provincial identities of Tyroleans, Carinthians and others were much stronger. The new constitution created bi-cameral legislature with upper house Bundesrat formed by representatives from federal Lands and lower house Nationalrat, where deputies were elected in universal elections. The Federal President was elected for a four-year term in a full session of both houses, while the Chancellor was elected by the Nationalrat. As no political party ever gained parliamentary majority, Austria was governed by coalitions of conservative Christian Social Party and right-wing Greater German People's Party or Landbund which were more conservative than the first government of Social Democrat Karl Renner of 1919–20, that had established a number of progressive socioeconomic and labour legislations. After 1920, Austria's government was dominated by the anti-Anschluss Christian Social Party which retained close ties to the Roman Catholic Church. The party's first Chancellor Ignaz Seipel came to power in May 1922 and attempted to forge a political alliance between wealthy industrialists and the Roman Catholic Church. After the legislative elections of October 17, 1920 Social Democrats lost parliamentary majority and remained in the opposition until 1934, when they were banned by Dollfuss. Christian Socials won 85, Social Democrats 69, Greater Germany Party 20 and Peasants Union 8 seats. Michael Hainisch was elected Federal President. After October 1923 elections Ignaz Seipel stayed in power and resigned in November 1924 when he was succeeded by Rudolf Ramek. In December 1928 Cristian Social Wilhelm Miklas was elected to the post of Federal President and on 7 December 1929 Constitution was amended, reducing the rights of parliament, making the Federal President electable by a popular vote and giving him the right to appoint the federal government and to issue emergency laws. After the 1930 legislative elections Social Democrats emerged as the largest party with 72 seats, but Christian Social Chancellor Otto Ender created a coalition government without them. 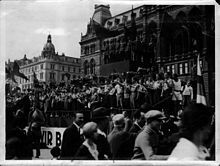 Despite the nation having a steady political party in power, the politics of the nation were fractious and violent, with both Social Democrat (Republikanischer Schutzbund) and right-wing (Heimwehr) political paramilitary forces clashing with each other. The country was divided between the conservative countryside population and Social Democrat controlled Red Vienna. In 1927, during a political clash in Schattendorf, an old man and a child were shot and killed by Heimwehr. On 14 July 1927 the shooters were acquitted and left-wing supporters began a massive protest during which the Ministry of Justice building was burned. To restore order police and army shot and killed 89 people and injured 600. The huge protest is known as the July Revolt of 1927. Social Democrats called for a general strike which lasted four days. After the 1927 events the conservative elements became stronger and the violence in Austria continued to escalate until the early 1930s when Engelbert Dollfuss became Chancellor. However the new state was difficult to control, as much of the former empire's important economic regions had been taken away with the foundation of new nation-states. The matter was further complicated by the fact that a number of these new nation-states were still dependent on Vienna's banks, but business was hampered by the newly erected borders and tariffs. The landlocked Austria was barely able to support itself with food and lacked developed industrial basis. In addition, Czechoslovakia, Hungary, Yugoslavia and Italy had imposed trade blockade and refused to sell food and coal to Austria, which eventually was saved by aid and support from the Western Allies. By 1922 one USA dollar was worth 19,000 kronen and half the population was unemployed. In December 1921 the Treaty of Lana between Austria and Czechoslovakia was signed in which Austria recognized the new state borders and relinquished claims to represent ethnic Germans in return Czechoslovakia provided a loan of 500 million kronen to Austria. To deal with post-war inflation Chancellor Ignaz Seipel in 1922 asked for foreign loans and introduced austerity policies. In October 1922 Britain, France, Italy and Czechoslovakia provided a loan of 650 million gold kronen after Seipel promised not to attempt Anschluss with Germany for 20 years and allowed the League of Nations to control Austria's economy. 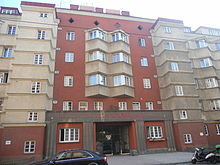 During the next two years state budget was stabilized and international supervision over finances ended in March 1926. Austria's central bank Oesterreichische Nationalbank was re-established in 1923, sales tax was introduced in 1923, and the Austrian schilling replaced krone in December 1924. The Great Depression hit Austria hard and in May 1931 the largest bank in Austria, Creditanstalt Bank collapsed. To improve its economy Austria wanted to conclude a customs union with Germany, but in 1931 this was denied by France and countries of the Little Entente. Dollfuss addressing the League of Nations in 1933. Chancellor Engelbert Dollfuss of the Christian Social Party took power in Austria on 20 May 1932, and moved the party and Austria towards dictatorship, centralisation and fascism, in part because the fascist Italy was its strongest international ally against Germany. In March 1933, Dollfuss took advantage of an error in a bill in parliament, and his cabinet voted to dissolve the National Council and declared that parliament has ceased to function. In May 1933 he created the Fatherland Front. While outwardly fascist, it was mostly Catholic and influenced by the papal encyclical Quadragesimo anno of 1931 which refuted liberalism and socialism in favour of corporatism. The government was in competition with the growing Austrian Nazi party, which wanted Austria to join Germany. Dollfuss's Austrofascism tied Austria identity to Roman Catholicism as a means to show the reason why Austria should not join a predominantly Protestant Germany. Political violence escalated into the Austrian Civil War of February 1934, between Nazis, Social Democrats and government forces. On 1 May 1934, Dollfuss created a one-party state, to be led by the Fatherland Front (German: Vaterländische Front), with the proclamation of the authoritarian "May Constitution". Name of the country was changed from the "Republic of Austria" to the "Federal State of Austria". The flag, coat of arms and anthem were changed, too. 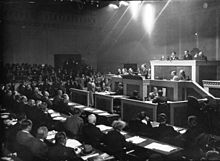 Federalism and the controlling powers of the Federal Council was curtailed, while elections for the National Council was abolished, its members nominated by four non-elective, corporatist-styled councils – the State Council (Staatsrat), Federal Culture Council (Bundeskulturrat), Federal Economic Council (Bundeswirtschaftsrat) and the States' Council (Länderrat), supposedly providing their best opinions on respective areas. In practice all legislation and appointments were exercised from above by the Federal Chancellor's and President's decree. The state took complete control of employer–employee relations, known as Ständestaat, and began to crack down on pro-Nazi and pro–German-unification sympathizers. The Nazis responded by assassinating Engelbert Dollfuss during the July Putsch of 25 July 1934 (see Maiverfassung 1934). This assassination by the Austrian Nazis infuriated Austria's neighbor, Fascist Italy under dictator Benito Mussolini. Fascist Italy had good relations with Austria under Dollfuss and Mussolini suspected German involvement and promised the Austrofascist regime military support if Germany were to invade, as the Nazis had claims on Italian-administered Tyrol. Italy's support helped save Austria from potential annexation in 1934. The successor to Dollfuss, Kurt Schuschnigg, maintained the ban on Nazi activities, but also banned Austria's national paramilitary force, the Heimwehr in 1936. ^ Vares, Mari (2008). The question of Western Hungary / Burgenland 1918-1923: a territorial question in the context of national and international policy (PDF). Jyväskylä: University of Jyväskylä. p. 25. ISBN 978-951-39-3074-5. ^ 1934 to 1938: Ständestaat in the Name of "God, the Almighty"
This page was last edited on 3 March 2019, at 20:01 (UTC).